We describe a method to separate organelles by density in living Drosophila embryos. Embryos are embedded in agar and centrifuged. This technique yields reproducible separation of major organelles along the anterior-posterior embryo axis. This method facilitates colocalization experiments and yields organelle fractions for biochemical analysis and transplantation experiments. Tran, S. L., Welte, M. A. In-vivo Centrifugation of Drosophila Embryos. J. Vis. Exp. (40), e2005, doi:10.3791/2005 (2010). A major strategy for purifying and isolating different types of intracellular organelles is to separate them from each other based on differences in buoyant density. However, when cells are disrupted prior to centrifugation, proteins and organelles in this non-native environment often inappropriately stick to each other. Here we describe a method to separate organelles by density in intact, living Drosophila embryos. Early embryos before cellularization are harvested from population cages, and their outer egg shells are removed by treatment with 50% bleach. Embryos are then transferred to a small agar plate and inserted, posterior end first, into small vertical holes in the agar. The plates containing embedded embryos are centrifuged for 30 min at 3000g. The agar supports the embryos and keeps them in a defined orientation. Afterwards, the embryos are dug out of the agar with a blunt needle. Centrifugation separates major organelles into distinct layers, a stratification easily visible by bright-field microscopy. A number of fluorescent markers are available to confirm successful stratification in living embryos. Proteins associated with certain organelles will be enriched in a particular layer, demonstrating colocalization. Individual layers can be recovered for biochemical analysis or transplantation into donor eggs. This technique is applicable for organelle separation in other large cells, including the eggs and oocytes of diverse species. Overview: This protocol employs agar plates for two distinct uses. First, the agar plates serve as egg collection surface; apple juice in the agar stimulates egg laying. Second, embryos embedded in the agar are held in a fixed orientation when the plates are centrifuged; a sufficiently high concentration of agar is necessary to prevent the plates from disintegrating during centrifugation. For simplicity's sake, a single type of apple juice agar is employed for both uses. In an Erlenmeyer flask, combine 25 g agar and 750 ml dH2O. Autoclave for 50 min on liquid cycle. In the mean time, prepare apple juice solution (step 1.2). In another Erlenmeyer flask, combine 25 g sucrose and 250 ml of apple juice. Heat on hot plate (to about 55°C) to dissolve sucrose. Then add 15 ml Nipagin M solution. Avoid higher temperatures, as they will cause Nipagin to break down. Once the agar solution has cooled enough that the flask can be handled by hand, combine the two solutions and mix thoroughly. Stir on hot plate until evenly mixed. Pour solution into Petri dishes (~ 0.5 cm high). 1 liter of solution is enough for about 100 small (60 mm diameter) or 40 large (100 mm diameter) dishes. Agar plates should dry for several hours or overnight at room temperature, otherwise they will be too wet for use. For long-term storage, keep them wrapped (in plastic bins or Petri dish sleeves) at 4°C. Overview: During the first 3 hours of development (at room temperature), Drosophila embryos are single cells (not counting the germ-line precursors, the posteriorly located pole cells). When properly oriented embryos of these stages are centrifuged, the major organelles separate by density along the long axis of the egg. At the cellularization stage, this large single cell is converted into thousands of small cells; the centrifugation forces employed will not rupture these cells. For successful segregation of major organelles, it is therefore critical to centrifuge embryos that have not yet completed cellularization. Adult flies are kept in cages to which apple juice agar plates are affixed at the bottom. Use a size of Petri dishes appropriate for the cages in use. To initiate an egg collection, prepare a fresh apple juice agar plate and cover a portion with yeast paste. Fruit flies eat yeast; in particular, yeast provides nutrition for egg production. The presence of yeast and apple juice in the agar also induces egg laying. To exchange the old with the new agar plate, the fly cage is inverted and banged on the bench top a few times. The flies will fall to the bottom and are briefly disoriented. That gives you a few seconds to quickly remove one agar plate and replace it with a fresh one. This exchange takes some practice, and details depend on the type of cage employed. Female flies store sperm from previous matings in internal pouches (spermathecae) from which sperm is released to allow fertilization of eggs. When well fed and undisturbed, females lay eggs shortly after fertilization, and thus the time of egg laying marks the time of fertilization and the beginning of development. When conditions are not optimal, females hold fertilized eggs for variable times before laying. To minimize the number of such mis-staged embryos, it is advisable to discard the first collection of the workday (a "pre-collection" of 30 to 60 min is sufficient). The presence of the fresh yeast induces the females to lay these held eggs, and subsequent egg collections tend to be dominated by eggs deposited shortly after fertilization. Collect eggs for up to 3 hours, depending on which embryonic stage is desired. Since at room temperature cellularization is completed after ~3.5 hours, longer collection times are not useful. Most consistent layering is achieved in young embryos, so for routine experiments we favor shorter collection times (1 hr or less). Sometimes flies get stuck to the yeast or to the surface of the agar plate. Remove them with tweezers. Overview: Drosophila embryos are covered by two protective layers: an outer layer (chorion) made of protein and an inner layer (vitelline membrane) predominately made out of wax. They protect the embryo against mechanical insults and desiccation. The chorion has two extensions (the egg filaments or dorsal appendages) that are easily visible as distinct structures. In this step, we will remove the chorion by soaking the eggs in 50% bleach. Once the chorion is removed, the embryo becomes transparent in transmitted light, allowing selection of specific embryonic stages for centrifugation. As the chorion would also interfere with many post-centrifugation procedures (e.g., fixation in step 6), removal of the chorion now will allow quick processing later. The 50% bleach treatment will dissolve the chorion within a few minutes, yet it does not harm the embryo. The vitelline membrane keeps the bleach out. We will continue the bleach treatment until the egg filaments are no longer visible. Afterwards, we will separate the embryos from the bleach by pouring the embryo/bleach slurry through a tiny sieve (a basket made of wire mesh). It is critical not to rush the bleach exposure step. If the bleach is washed off prematurely, later steps (e.g., removal of the vitelline membrane following fixation) might be compromised. Homemade wire baskets made out of sheets of stainless steel wire mesh. To make baskets, cut squares of ~ 2 x 2 cm out of the flat sheet and indent them in the middle. Place the agar plate under a dissecting microscope and observe the embryos by transillumination. Make sure to identify the egg filaments (see Figure 2A). Squirt 50% bleach onto the agar plate, covering the embryos. Agitate the agar plate occasionally to swirl the embryos around in the bleach. Once the egg filaments are no longer visible (typically after 3-5 min, but times may vary), the chorion has been removed successfully. In the next step, a wire mesh basket will be used as sieve to separate the embryos from the bleach. Grab the wire basket with tweezers and hold it over the inverted cover of the agar plate. The cover will serve as reservoir to catch the bleach dripping through the wire mesh. Pour the bleach/embryo slurry from the agar plate through the wire mesh. If a significant number of embryos remain on the agar plate, squirt dH2O onto the plate and pour the dH2O/embryo slurry through the wire mesh. If a significant number of embryos spill over into the reservoir, pour the reservoir contents through the wire mesh. Touch the bottom of the wire mesh to a paper towel to blot away any excess liquid. Then squirt dH2O onto the wire mesh to rinse off remaining bleach. As described above, the cover plate can be used as reservoir to recover any embryos accidentally washed off. You can minimize losing embryos by pointing the stream of water from the squirt bottle along the perimeter of the wire basket. Frequently blot off excess liquid. Repeat this washing step five to ten times, until all bleach has been removed. If the wire basket still smells of bleach, washing should continue. Overview: Drosophila eggs are much longer (~ 500 μm) than wide (~180 μm). To get maximal and consistent separation of organelles during centrifugation, we orient embryos such that their anterior ends point towards the center of rotation (Figure 1, 3). That way, the lightest intracellular structures (lipid droplets) accumulate at the anterior end in all embryos, while very dense structures (yolk components) accumulate near the posterior end. Embryos are inserted into small vertical holes in apple juice agar, with the anterior ends sticking up. The agar keeps the embryo in a fixed orientation during centrifugation. Wash embryos out of the wire basket with TSS and into an empty Petri dish. The embryos should sink to the bottom. Transfer the Petri dish containing the embryos in TSS onto a dissecting scope and observe by transillumination (embryos will look similar to those depicted in Figure 4). Using a P200 pipettor, select embryos of desired stages and transfer them to a small agar plate. Specific stages can easily be recognized visually (Figure 4; for more detail, see 1). Work quickly since embryos are aging and prolonged submersion (longer than 30 min) in TSS may affect development. Remove most TSS with a pipette and a Kimwipe. The surface of the agar should be slightly moist which makes it easier to push embryos around. However, there should not be pools of liquid remaining anywhere on the plate since excess liquid during centrifugation will cause the embryos to slide out of the holes. Using a needle, poke vertical holes into the agar near wherever an embryo is located. It is hard to poke holes that are perfectly vertical because you have to hold the needle at an angle to be able to simultaneously watch under the microscope. A minor inclination of the needle is actually advantageous because this creates a slight depression/grove on one side of the hole so that the embryo will easily slide along it and into the hole. It is sufficient to puncture the surface of the agar since the agar is soft enough that once an embryo is partially inserted into a hole it can be pushed in further without damage. Make sure you recognize the anterior and posterior ends of the embryos, as the embryos should be pushed into the holes in a consistent orientation, typically with the anterior end up. The vitelline membrane at the anterior end is characterized by a specialized structure, the micropyle (Figure 2), through which the sperm enters during fertilization. Using the blunt end of the needle, you can push against the embryo to move it along the agar and to orient/maneuver its posterior end towards a punctured hole. Then push against the anterior end towards the hole. This should easily glide the embryo into the hole along the slight depression generated during puncturing. As the embryo tilts up, push it deeper down into the hole. When fully pushed in, the embryo is usually already fairly vertical. If not, you can align the inserted embryo more vertically by pushing on it sidewise. If the hole is not too big, the embryo position will be stably held by the agar throughout centrifugation. With practice, it is possible to embed 100-250 embryos per plate. It will depend on the particular application how many are needed: If embryos are used for live imaging or as donors for transplantation experiments, only few are required. If embryos are to be fixed and immunostained, a fraction will be lost during the post-centrifugation processing, and one has to start with higher numbers. Keep in mind that embryos continue to develop during mounting so if a narrow development stage is desired, the overall time for mounting needs to be kept short. If there are any embryos leftover that were not embedded, remove them from the plate with a moistened fly brush. Dip the fly brush into liquid (e.g. 1xTSS), carefully wipe across the top of the plate (while watching under the dissecting scope) to sweep up any leftover embryos, and wash the embryos out of the brush by dipping the brush into liquid again. Overview: The plates are transferred to swinging buckets of a Sorvall RT7 Plus centrifuge and centrifuged for 30 min at 4000 rpm, which corresponds to ~3000 g. After centrifugation, plates are covered with TSS. With a needle, embryos are dug out of the holes in the agar and transferred into appropriate vessels via a pipettor. Transfer plates to swinging buckets of the centrifuge, agar side down. Make sure centrifuge is evenly balanced. Settings for centrifugation: temperature = 4-10°C, rpm = 4000, time = 30 min. After the centrifugation, place agar plate under the dissecting microscope again and cover the plate with a layer of TSS. Using the blunt end of the needle, dig the embryos out of their holes. They will float in TSS, but will remain submerged. Embryos will appear obviously layered, with a brown cap at the anterior end, a clear middle region, and a dark, grey area at the posterior end (Figure 2, 5A). Discard embryos that fail to show distinct layering. Using a P200 pipettor, transfer the well-layered embryos in TSS to a new vessel, e.g. a scintillation vial or microcentrifuge tube, depending on the application. Depending on the application, embryos will subsequently be treated in various ways. For direct observation by bright-field or epifluorescence microscopy, embryos are transferred in buffer to a glass slide, and mounted under a 22x22 mm #1.5 coverslip, with 18x18 mm #1 coverslips as spacers. For long-term observations, it may be necessary to replace the buffer with halocarbon oil 27. If embryos are to be fixed, they should be transferred in step 5.6 to a scintillation vial. They can then be fixed using standard fixation techniques1. These techniques typically employ agitation in a heptane-methanol emulsion to remove the vitelline membrane. Note that for centrifuged embryos the efficiency of this devitellinization step is low. It is therefore advisable to start with as many embryos as practical or to remove the vitelline membrane manually 1. If embryos will be used in transplantation experiments (e.g., to remove a particular organelle layer from the centrifuged embryos), they are transferred to agar plates and mounted on coverslips, using standard procedures as for uncentrifuged embryos 3. The layering induced by centrifugation is stable for tens of minutes. If the centrifugation worked as expected, the major embryonic organelles will sort out by density 2. For example, the low-density lipid droplets will accumulate at the anterior end; the high-density yolk vesicles will accumulate at the posterior end (Figure 1, 2). 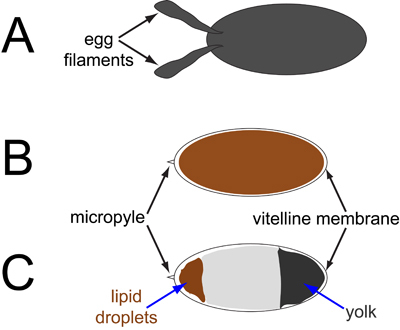 Lipid droplets and yolk vesicles are storage organelles for lipids and for proteins. Confirmation of density-dependent stratification is achieved via visual inspection of the living embryos by transillumination under a dissecting or compound microscope. The embryos should appear as in Figure 5A: The lipid droplets will form a solid brown layer at the very anterior tip (a "lipid cap"); yolk accumulation will result in a dark gray zone at the posterior end. These two dark layers are separated by a broad clear zone that represents other organelles and cytoplasm. If embryos are centrifuged after cellularization, layering will be minimal (Figure 5C). If an epifluorescence microscope is available, these living, centrifuged embryos can be examined under UV excitation. Under these conditions, the yolk displays intense blue autofluorescence (Figure 5B). A compact layer of autofluorescent material at the posterior pole indicates successful centrifugation and serves as a marker for the posterior end. Note that the appearance of these layers will change drastically if the embryos are fixed. For example, when embryos are fixed by standard heat- or formaldehyde fixation followed by heptane-methanol devitellinization 1, lipid droplets become translucent and the lipid layer appears whitish and fluffy by bright-light microscopy, rather than dark brown (Figure 5D). Yolk autofluorescence is partially or completely destroyed by fixation, becoming much less intense or even undetectable. Figure 1. Separation of organelles by centrifugation (modified after 2). Centrifugation of oriented embryos results in distinct stratification (bright light). Major organelles accumulate at characteristic positions along the anterior (up) - posterior (down) axis: lipid droplets (detected in fixed embryos by Nile Red staining); endoplasmic reticulum, Golgi, and mitochondria (detected in living embryos via the YFP markers described in the main text); yolk (detected by autofluorescence). The fluorescence images were acquired by confocal microscopy. Figure 2. Schematic depiction of embryos. A. Egg with egg shell and the prominent egg filaments (dorsal appendages). As the egg shell is not translucent, the egg appears uniformly dark. B. Egg with chorion removed. At the anterior end (left), the micropyle is visible. Depending on the development stage, the embryo inside the vitelline membrane will appear uniformly dark brown or show various structures. See Figure4 for examples. C. Centrifuged embryo, oriented as in the protocol described here. Lipid droplets accumulate as a brown "cap" at the micropyle end; yolk forms a gray layer at or near the opposite end. Figure 3. Schematic description of the procedure. Left: Embryos without chorion are placed on top of an agar plate and pushed with a needle into holes in the agar. This mounting results in a consistent orientation of all embryos, with anterior ends up. Right: After centrifugation, embryos are stratified. Agar is overlaid with TSS (blue), and embryos are recovered from the agar with the needle. Once suspended in TSS, embryos can be picked up with a pipettor. Figure 4. Bright-light images of living Drosophila embryos, similar to how they will appear in step 4.1. Embryos are shown in standard orientation: anterior end to the left, posterior end to the right, dorsal side up, and ventral side down. A time-lapse movie of early embryogenesis is available as part of the video accompanying this protocol. A. Cleavage stage embryos appear uniformly brown. Stages like this are ideal for in-vivo centrifugation. B. Blastoderm embryos have a clear rim that appears similar on all sides. This clear periphery is in part due to accumulation of nuclei at the plasma membrane and in part due to inward transport of yolk vesicles and lipid droplets 7. This clear periphery expands until near the end of cellularization 1. Embryos can still be successfully stratified by centrifugation until the end of cellularization 8, though layering of yolk and nuclei is not as consistent as in cleavage stages. C. After cellularization, embryos appear asymmetric; dorsal and ventral sides become distinct, and various folds develop. The embryo shown is in early germ-band extension. 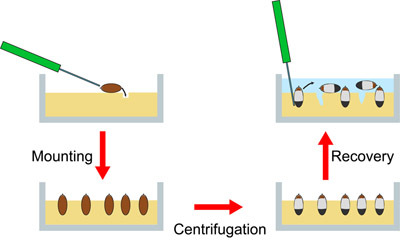 In these stages, centrifugation is no longer effective at stratifying the major organelles. Figure 5. Centrifuged embryos. All embryos in this figure were centrifuged with their anterior end up and are shown in that orientation. A. Bright-light image of a successfully centrifuged embryo. A brown layer at the very anterior end is due to lipid-droplet accumulation. A broad gray layer near the posterior end is due to yolk vesicles. There is frequently a clear zone below the yolk layer, of unknown origin. A yellowish zone is often apparent above the yolk layer; it probably represents mitochondria. Soluble proteins are found throughout the clear layer between lipid droplets and yolk 2. B. The embryo in A viewed by epifluorescence microscopy under UV excitation. The blue autofluorescence characteristic of yolk helps identify the posterior end. C. Embryo centrifuged during germ-band extension, i.e., after cellularization. Yolk may still accumulate at the posterior end, but otherwise layering is minimal. D. Successfully stratified embryo, after heat fixation. The lipid-droplet layer appears white and fluffy, rather than dark brown as in unfixed embryos (A). E. & F. Embryos expressing His2Av-GFP and imaged by confocal microscopy (modified after 2). E: centrifuged at cleavage stages; His2Av-GFP appears to only mark the lipid-droplet layer since few nuclei are formed by this time. Depending on the focal plane, nuclei may be visible just under the droplet layer (not shown here). F: centrifuged at blastoderm stages; His2Av-GFP marks both the lipid-droplet layer (top) and nuclei (in a broad zone below the droplet layer). Make sure that the agar concentration is high enough. If it is too low, the agar will disintegrate during centrifugation, and the embryos will burst or be randomly oriented. If the agar concentration is just slightly too low or if the agar is wet (insufficiently dried or insufficient removal of excess TSS in step 4.3), the embryos will float out of their holes during centrifugation and become improperly oriented. If the agar is poured too thinly, it will also collapse or crack during centrifugation. Make sure that embryos have not advanced beyond cellularization stages. Otherwise, separation of organelles will not work (Fig. 5C) since organelles will become sequestered within thousands of individual cells. In younger embryos at the one cell stage, organelles are free to migrate large distances and accumulate according to their characteristic density. To avoid analyzing embryos that are too old, make sure to (i) include a pre-collection to allow females to lay old eggs (step 2.4), (ii) collect embryos for 3 hours or less (step 2.5), (iii) visually select embryos before cellularization stages for embedding into agar (step 4.2), (iv) keep embedding time short to prevent development through the end of cellularization (step 4.6), and (v) discard embryos that did not layer correctly (step 5.6). Do not skimp on the centrifugation time. Although some of the embryos will show nice layering even after only 10 minutes of centrifugation, the separation is inconsistent from embryo to embryo. 30 min spins give highly consistent results. Also, the longer the centrifugation time, the longer the layers are stable after the centrifugation has ended. This is important for those applications in which it takes time to process the embryos further before use (e.g., if they need to be processed for transplantation experiments or mounted for confocal analysis). Egg collection and chorion removal Many different protocols exist for steps 2 and 3 1, 3, 9, and will work as well as the ones described here as long as the embryos used are young, egg yield is high, and the fraction of mis-staged embryos is minimized. Anterior-posterior alignment The protocol orients all embryos such that the posterior end is buried in the agar and the anterior end is up (Fig. 3). This orientation is good for consistency, so that it is possible to use the micropyle as a landmark which end pointed up during centrifugation (Fig. 1, 5). However, with practice, it is easy to pick out the orientation of centrifuged embryos by the distinct appearance of the lipid-droplet and yolk layers by bright-field microscopy. Then it becomes possible to mount embryos with either end up; this flexibility speeds up the mounting process. Unoriented centrifugation The most-time-consuming and technically challenging aspect of the protocol is mounting the embryos in agar (step 4). It requires touching each embryo twice (once to insert it into the hole and once to recover it after centrifugation). As an alternative, one can transfer embryos at step 4.1 into microcentrifuge tubes filled with TSS. When these tubes are centrifuged in a microcentrifuge (13,000 rpm, 10-30 min), embryos will also typically layer well 10-13. This variation allows one to process hundreds of embryos at the same time very quickly. However, layering is not as consistent; a fraction of the embryos does not develop distinct layers despite much higher centrifugation forces (~16,000 g) than applied in the protocol above. More challenging is the fact that the orientation of the embryos is variable, and one can observe separation at various angles to the major embryo axis. This variability requires the experimenter to sort out after the centrifugation how a particular embryo was arranged in the centrifuge tube. With the use of the yolk autofluorescence as a marker for the most-dense part of the embryo, this is often possible, though it requires much practice and more judgment to do it reliably. If there are sufficient embryos in the sample, one may be able to sort out those instances in which embryos happened to be arranged like in Fig. 1. Centrifugation of embryos in their egg shell It is possible to embed embryos in agar for step 4 without removing the chorion first 2. In this approach, embryos on the collection plate are covered with halocarbon oil instead of 50% bleach in step 3.2 (halocarbon turns the chorion translucent). Embryos of appropriate stages are selected and transferred to a new agar plate using tweezers; by grabbing only the egg filaments with the tweezers, damage to the embryo proper is avoided. Embryos are embedded as in step 4.4 through 4.8, with the anterior egg filaments sticking up out of the hole in the agar. The egg shell is removed by 50% bleach treatment after the embryos have been centrifuged and dug out of the agar as in step 5.4. Centrifugation in the presence of the egg shell may improve the rate of devitellinization after fixation (step 6.2), but selection of the correct stages for centrifugation (step 4.2) is more challenging. Embryo centrifugation is particularly useful for colocalization experiments, i.e., to test if a particular protein localizes to a certain major organelle. For example, the Klar protein is present on early embryonic lipid droplets, yet this localization is challenging to demonstrate in intact embryos. In part, this is because both Klar puncta and lipid droplets are abundant in the embryo periphery 10, making spurious colocalization hard to rule out. However, centrifugation concentrates lipid droplets into a distinct layer, and thus, colocalization with Klar signal becomes obvious 10. Similar analysis has unambiguously demonstrated the localization of other proteins to lipid droplets 8, 13-15, including surprising examples like certain histones 2 and in cases where a protein is present ubiquitously but enriched on lipid droplets 8. As embryos can be selected visually by developmental stage (step 4.2), it is even possible to detect developmentally regulated recruitment of proteins to lipid droplets 8, 15. Testing for colocalization with lipid droplets is particularly easy since lipid droplets accumulate in a visually distinct "cap", so no further marker or stain is required to identify this layer. In fact, because of its ease and potentially striking visual results (Fig. 1, Fig. 5 D, E), our laboratory employs this technique now routinely as a first test whether a candidate protein is localized to lipid droplets. In principle, similar colocalization studies should work for the other organelles shown in Fig. 1, and likely for others (including intracellular parasites) whose distribution in centrifuged embryos has yet to be documented. Since centrifugation concentrates organelles into tight bands, it facilitates isolation of a fraction enriched in these organelles. This approach has already been used to recover lipid droplets for transplantation into donor embryos 2. It may also be possible to biochemically analyze the enriched fraction (e.g., by cutting layers off embryos after fixation 15). The method described here has applications beyond Drosophila embryos, as centrifugation can be used to stratify the eggs of many different species (including frogs, nematodes, tunicates, annelids, sea urchins, mollusks, and Cnidarians) 16. In our own laboratory, we have used the protocol above for embryos of the housefly Musca domestica 2 and have employed unoriented centrifugation in the analysis of embryos from the fungus gnat Sciara coprophila 17 and the snail Ilyanassa obsoleta 17. Finally, this method is not restricted to embryos: Centrifugation can also be useful to stratify other large cells, such as oocytes (e.g., in Drosophila 2, 18 and the milkweed bug Oncopeltus fasciatus 17). For different specimen, the exact centrifugation conditions need to be optimized: For example, 10 minutes at 3000 g is sufficient to efficiently stratify embryos of Musca domestica 2, and if centrifuged much longer, the embryos tend to break apart during fixation and immunostaining. We thank Susan Gerbi, Heidi Smith, and David Lambert for supplying material to test in-vivo centrifugation on Sciara coprophila and Ilyanassa obsoleta, respectively. We thank members of the Welte lab for comments on the technique and manuscript. Development and refinement of the in-vivo centrifugation assay was supported by NIGMS grant GM64687 to MAW. The images shown in Fig. 1 and Fig. 5E,F were previously published2 and are reprinted here with permission. Roberts, D. B. Looking at embryos. Drosophila: A Practical Approach. 2nd Edition, University Press. Oxford. 179-214 (1998). Cermelli, S., Guo, Y., Gross, S. P., Welte, M. A. The lipid droplet proteome reveals that droplets are a protein storage depot. Curr Biol. 16, 1783-1795 (2006). Kiehart, D. P., Crawford, J. M., Montague, R. A. Quantitative microinjection of Drosophila embryos. Drosophila Protocols. Sullivan, W., Ashburner, M., Hawley, R. S. Cold Spring Harbor Laboratory Press. Cold Spring Harbor, NY. 345-359 (2000). LaJeunesse, D. R. Three new Drosophila markers of intracellular membranes. Biotechniques. 36, (784-788), 790-790 (2004). Schuh, M., Lehner, C. F., Heidmann, S. Incorporation of Drosophila CID/CENP-A and CENP-C into centromeres during early embryonic anaphase. Curr Biol. 17, 237-243 (2007). Clarkson, M., Saint, R. A His2AvDGFP fusion gene complements a lethal His2AvD mutant allele and provides an in vivo marker for Drosophila chromosome behavior. DNA Cell Biol. 18, 457-462 (1999). Welte, M. A., Gross, S. P., Postner, M., Block, S. M., Wieschaus, E. F. Developmental regulation of vesicle transport in Drosophila embryos: forces and kinetics. Cell. 92, 547-557 (1998). Tran, S. L., Welte, M. A. unpublished observations. Forthcoming. 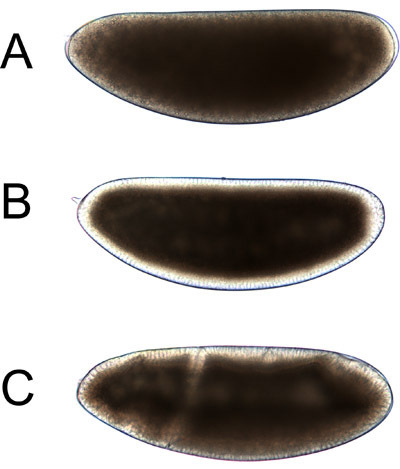 Rothwell, W. F., Sullivan, W. Fluorescent analysis of Drosophila embryos. Drosophila Protocols. Sullivan, W., Ashburner, M., Hawley, R. S. Cold Spring Harbor Laboratory Press. Cold Spring Harbor, NY. 141-157 (2000). Guo, Y., Jangi, S., Welte, M. A. Organelle-specific Control of Intracellular Transport: Distinctly Targeted Isoforms of the Regulator Klar. Mol Biol Cell. 16, 1406-1416 (2005). Meyer, W. J. Overlapping Functions of Argonaute Proteins in Patterning and Morphogenesis of Drosophila Embryos. PLoS Genet. 2, 1224-1239 (2006). Shubeita, G. T. Consequences of motor copy number on the intracellular transport of kinesin-1-driven lipid droplets. Cell. 135, 1098-1107 (2008). Welte, M. A. Regulation of lipid-droplet transport by the Perilipin homologue LSD2. Curr. Biol. 15, 1266-1275 (2005). Phadnis, N., Welte, M. A. Unpublished Observations. Forthcoming. Morgan, T. H. Chapter XXII: The redistribution of the visible materials of the egg by centrifuging. Experimental Embryology. Columbia University Press. New York. (1927). Welte, M. A. Unpublished Observations. Forthcoming. Bownes, M. Abnormal oogenesis and embryogenesis resulting from centrifuging Drosophila melanogaster females. J Embryol Exp Morphol. 40, 65-81 (1977).